Lexington serves as a great small town Jewish success story. Lexington is the smallest community in the state of Mississippi to have supported a synagogue for scores of years. Although Jews have lived in Lexington since the late 1830s, it took several decades for them to organize religiously. In the 1890s, members of the Sontheimer and Hyman families began to hold services in Henry Rosenthal's home that were also led by Rosenthal. Members of a number of prominent Jewish families were married in the local Methodist church before a permanent house of worship was built. As the community continued to grow, the Jewish families of Lexington conducted High Holiday services at the Lexington Opera House. Lena Levy and Julia Cohen organized the first Sunday school in 1901. In 1902, they hired Rabbi Abram Brill, who served the Hebrew Union Congregation in Greenville, Mississippi to conduct services one a month. The Jewish community of Lexington established a cemetery in 1904. In that same year, Rabbi Brill convinced the local Jews to form Temple Beth El (House of God). Morris Lewis and Sam Herrman purchased the lot where the temple stood. To raise funds for the building Lena Levy organized a group to perform at the Lexington Opera House. Most of the cast were members of the Baptist church. Additional funds came from members of Lexington’s Jewish community. In November of 1905, Temple Beth El’s 30 members dedicated their first synagogue on Spring Street, a small frame structure with an entrance hall, two small classrooms on either side of the front entrance, and a sanctuary. The sanctuary took up most of the synagogue’s interior. Each side wall featured four tall stained-glass windows with intricate Tiffany-style patterns, installed in 1926. The simple symmetrical exterior with its tall, gabled front porch resembled a rural church. The only visible Jewish symbol was a round window with a small, six-pointed star above the entry that was installed in 2004. For many years, it had no bathroom, and people had to use San and Flora Hermann's home across the street. In 1907, Temple Beth El had 15 member families, many of whom were young, as evidenced by the 20 children in the congregation's religious school. From its founding, Lexington has been a Reform congregation and became affiliated with the Union of American Hebrew Congregations in 1904. Temple Beth El relied on student rabbis, visiting rabbis and congregants to lead worship and teach religious school. Temple Beth El's services were almost entirely in English and held on Sundays, when their visiting rabbi was available Temple Beth El also hosted weddings, confirmations, funerals, bar mitzvahs, and bat mitzvahs. The largest confirmation class was held in 1929 with thirteen confirmants. Rabbi Brill traveled by train to Lexington to lead services once per month until 1911, when he left Greenville. Henry Rosenthal led services when Brill wasn’t available; he always occupied the front pew so that he might participate in the service. Following Brill, Rabbi Sol Kory of Vicksburg came once per month. A humble man, who devoted much of his time and money to charity, he would typically sport threadbare attire. The congregation once gave him $50 to buy a new coat to show their appreciation, but he used it to buy poor families food so that they could enjoy their Christmas. The following year, they gave him a new coat, and he wore it for each visit. Rabbi Stanly Brav and Rabbi Samuel Shillman, both from Vicksburg, took over after Rabbi Kory died. In 1940, Beth El had 30 members. Despite these small numbers, Beth El had an active sisterhood named after Julia Lewis. Lexington also had a local B'nai Brith chapter, the Isidore Hyman Lodge that formed in 1926. 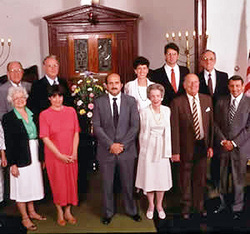 In 1954, Rabbi Perry Nussbaum of Jackson, took over the pulpit, and he was followed by Rabbi Alan Schwartzman of ﻿Vicksburg,﻿ Rabbi Eric Gurvis, Rabbi Steven Engle, Rabbi Jim Egolf, and Rabbi Valerie Cohen, all hailing from Jackson. Students from Hebrew Union College, America’s seminary of Reform Judaism, conducted High Holiday services, and afterwards, congregants ate dinner at the mansion of Morris and Julia Lewis. Little Temple Beth El was put on the national Jewish map thanks to the generosity of Gus and Cecil Herrman. The two brothers from Lexington, who never married, left the bulk of their estates to Hebrew Union College (H.U.C.). Gus gave H.U.C. $7 million, which is the largest single gift ever given to the institution. Cecil gave over $3 million. These gifts to H.U.C. are quite remarkable as Beth El never had a full-time rabbi of its own. Cecil and Gus were inspired to make this gift due to their relationship with Rabbi James Wax, who had served Beth El as a student rabbi before his long and distinguished career at Temple Israel in Memphis. Temple Beth El continued to actively live into the 21st century with the support of a small contingent of dedicated members who resided in Lexington and surrounding areas. On December 3, 2005, Temple Beth El celebrated its 100th anniversary with a special Shabbat service attended by people from across the country who have roots in Lexington. 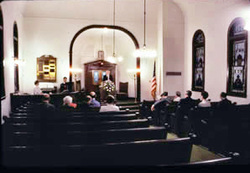 A number of non-Jews also attended services , helping to keep the doors open until 2009. The longevity of Temple Beth El was remarkable; no other small town in Mississippi supported a Jewish congregation for as long. While Beth El has now closed, their 100-year legacy of Jewish life in Holmes County serves as an impressive reminder of how a small number of people can achieve remarkable feats.